In Namibia, Makalani palm leaves and vegetable-based dyes are woven into baskets using age old recipes handed down through generations. 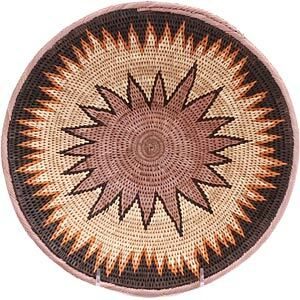 The Kavango and Ovambo people in Northeast of Namibia create these beautiful baskets from local Makalani palm leaves. Plant materials are plentiful in this area of the Okavango Delta, which is the largest inland delta on earth and a true oasis in the Kalihari Desert. Getting the natural dye to soak into the waxy palm leaves is very tricky and some weaving material may be left soaking in a dye bath for more than a week at a time. A portion of the proceeds from each basket sold goes to a fund which provides educational opportunities for the girls of Namibia. Weave quality, basket size, difficulty of producing dye colors, and complexity of pattern all combine to determine the prices on these one-of-a-kind creations.